Hotter than McDonald's Minions toys, National Day Parade (NDP) Preview and Actual Day tickets are always as elusive as they come and one will certainly have to extremely lucky to be able to snag some. We tried balloting but were unsuccessful as well. Luckily, we were fortunate enough to be invited to the NDP National Education (NE) 1 show a few Saturdays back - which essentially is a dress rehearsal for the actual parade but with the audience predominantly made up of Primary 5 students. The great thing about attending a parade with a majority of school kids is the infectious atmosphere that they conjure up. Almost everything was met with boisterous cheers, loud screams and enthusiastic claps and that definitely upped the entertainment factor! 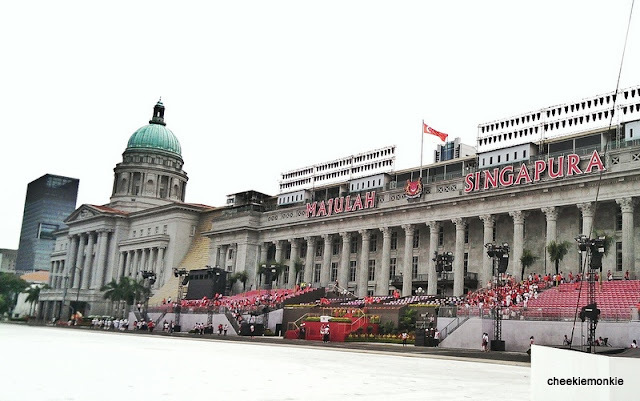 With this year being our Golden Jubilee year, the NDP returns to the Padang, a place where it all began - starting with Singapore’s self-government in 1959 and the first National Day Parade in 1966. 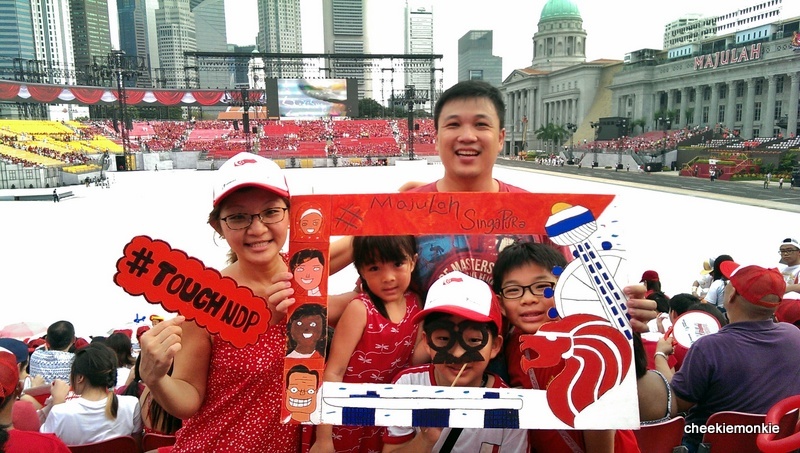 Using the theme of “Majulah Singapura”, NDP 2015 will serve as a timely reminder of our struggles in the early years and how we overcame them, celebrate our collective achievements, and rally Singaporeans to aspire towards the future. So yes, this year's NDP will be one that is both epic and emotive. And after sitting through the entire parade, I can tell you it is the best NDP I have seen in my entire life. I love it how all the show segments were kept simple, yet meaningful. There were no over-the-top choreography or outrageous costumes - in fact, nothing was overly showy and every segment felt connected and tugged at the heartstrings. "This is the BEST NDP ever! I love it because it reminds me of the past and lets me look forward to the future." This year's NDP will be the first-ever parade to weave traditional crowd favourites like the Parade and Ceremony, Aerial Display, and Mobile Column into the entire flow of the Show. 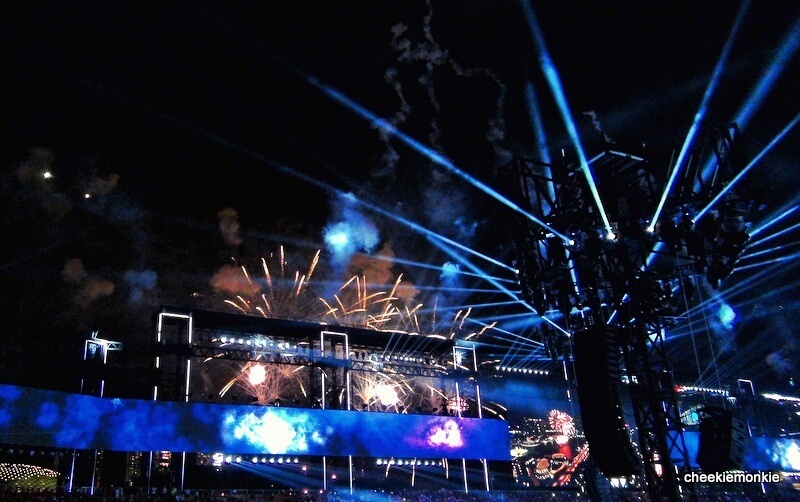 This was intentionally planned by the Show Committee, who wanted to bring together a mass display with song and dance. Something that is distinctly different from the rest of the previous Parades. Featuring about 450 participants in nine contingents representing different sectors that contributed to the early growth of the nation, the Vintage Parade will showcase iconic outfits and props from past street parades, including old military uniforms and #matachengtehkor! Participants include pioneers who marched in the earlier parades from the 1960s to 1970s, like this colourful streamer float from the People’s Association. Displaying strength, resillience and vigilance of our defence pillars, the Mobile Column at this year’s NDP will be the largest yet in terms of size and numbers! Featuring four distinct segments, the NDP 2015 Mobile Column pays tribute to the contributions of our pioneers who built up Singapore's defence and security forces as well as gives spectators a glimpse of the capabilities, readiness and vigilance of the SAF, SPF and SCDF in various settings. 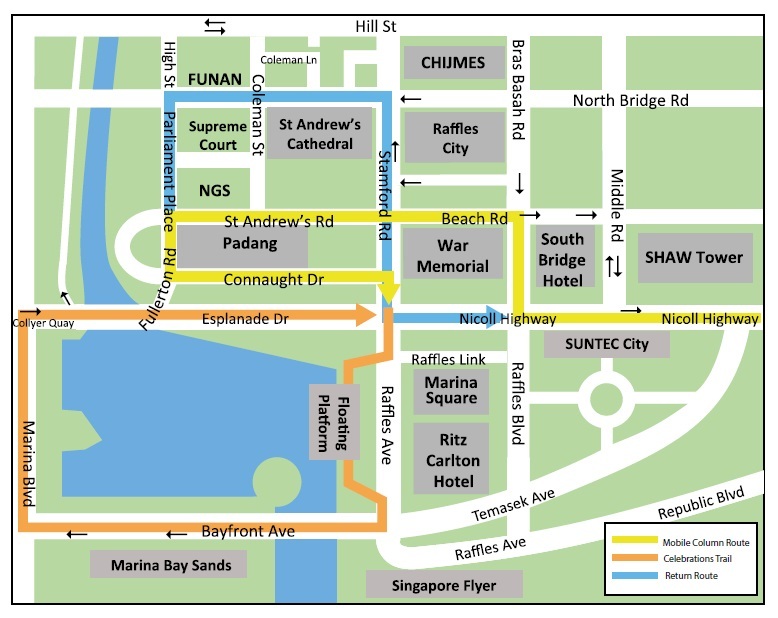 TIP: After rolling past the Padang, a section of the Mobile Column made up of 28 vehicles will form the Celebrations Trail around Marina Bay. 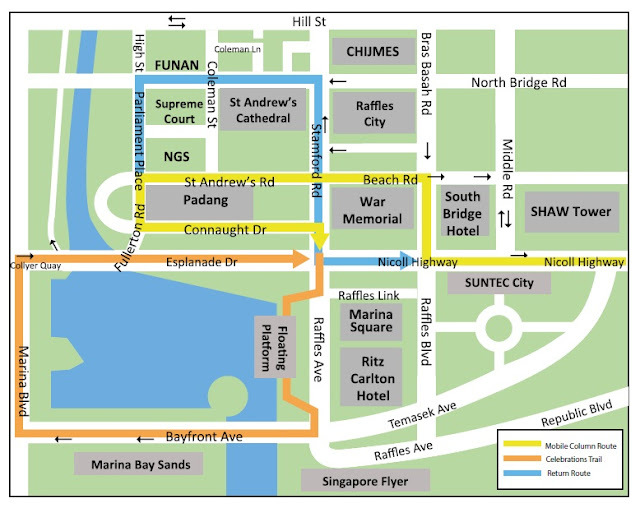 The Celebrations Trail will pass iconic landmarks along the Singapore skyline, such as The Float @ Marina Bay and Marina Bay Sands, before joining Singaporeans on the Esplanade Bridge to recite the Pledge and sing the National Anthem at 8.15pm. So you know where to be if your kids want to catch sight of the vehicles! This year's Aerial Display segment will feature 50 aircraft - largest number to participate in the NDP at the Padang to date! Other than the traditional flypast of the State Flag across the Padang during the singing of the National Anthem, there will be plenty of spectacular and jaw-dropping aerial manoeuvers that will make the segment a truly unprecedented airshow. Yes, and it comes complete with supersonic roars! I got to see the hard work that went behind the scenes in preparation for the flypast last year so even though the flypast may last seconds, the perspiration and passion that goes into the flypast is way beyond that. Oh and whatever you do, DO NOT miss the Black Knights' high-octane performance where a formation of four Black Knights will perform the “Criss Cross” manoeuvre with smoke trails, followed by two Black Knights executing a near-vertical climb. Remember I mentioned that this year's show will be an integrated one? The Parade and Ceremony segments will be no different. Arguably the most boring segment of the lot for the monkies ("Because it's just all marching and marching"), we were all pleasantly surprised to find the Parade and Ceremony making their appearance only in Chapter 2 of the show, "Progess", which highlights how far we have come as a nation. Chapter 1, "Beginnings", kicks off the show with a stylised account of Singapore’s history, tracing the origins of our multi-ethnic, multi-religious society from our growth from a sleepy fishing village to a bustling colony. The Parade and Ceremony features a total of 37 contingents on parade at the Padang, comprising four Guard of Honour contingents, the Singapore Armed Forces (SAF) Colours Party, the Combined Band, five military and civil defence contingents, 10 uniformed group contingents, and 16 social and economic contingents. The late Mr Lee Kuan Yew had never failed to attend all previous NDPs and this year will be the first without his presence. A tribute video in the Prologue of the NDP 2015 Show, celebrating the late Mr Lee’s contributions to the nation will be played at the show, in addition to leaving the seat where Mr Lee would have taken empty, with a bouquet placed on it. In addition, the segment will honour him by having a special flypast by the RSAF Black Knights. The “Five Stars” Tribute Aerial Flypast signifies Singapore’s ideals of democracy, peace, progress, justice and equality. Billed as Singapore's biggest and most ambitious parade at the Padang, Singapore's story will unfold in six chapters, including familiar sights and sounds that even the monkies can identify! Do keep a lookout for Chapter 6: Onwards, where over 600 primary school children - the largest group performance by primary school children in recent years - will take the stage to put on an electrifying dance number, complete with dazzling changing lights! I have to say the continuous stretch of LED panels from end-to-end in the seating gallery - which creates a panoramic cyclorama for the spectators at the Padang - helped us to fully immerse in the various segments of the show too. The original singers of theme songs from past parades will return to perform iconic songs that we all love. Stefanie Sun will sing a medley of “We Will Get There” and “One United People”, Corrinne May will be singing “Song for Singapore”, and Kit Chan will perform the ever-popular “Home”. 9. Biggest Fireworks Display, ever! What is NDP without Fireworks? This year’s National Day fireworks display promises to be the biggest in its history, with twice as many used during NDP 2014! Revolving around the NDP 2015 theme of “Majulah Singapura”, the NDP 2015 Fireworks Display is to complement the NDP 2015 Integrated Show at the Padang for a grand spectacle with pyrotechnics at the Padang and roof-top of 7 surrounding commercial buildings, together with level high fireworks from the main barge at the Marina Bay area. Key highlights of the fireworks include special designed fireworks displays and a Rainbow Arc firing over 300m. What this means is the fireworks this year will have a wider coverage, giving anyone around the Marina Bay area a 360-degree view of the spectacle! 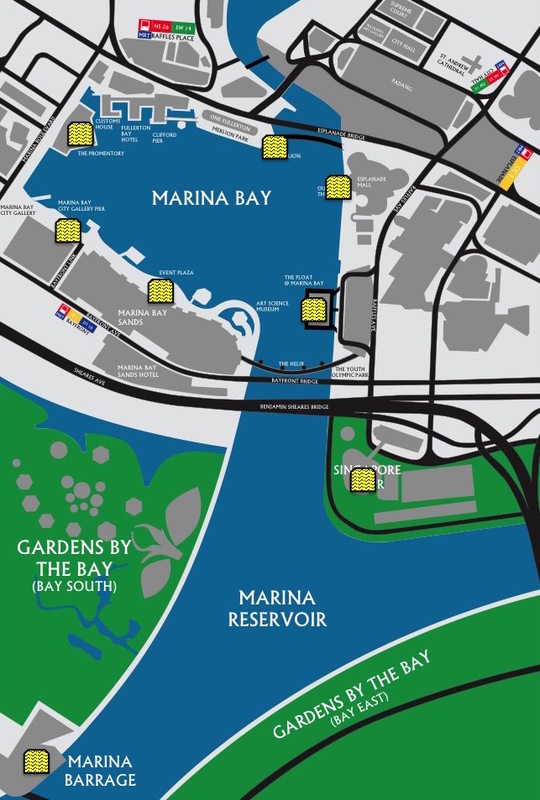 TIP: As part of the Golden Jubilee weekend celebrations by the bay, there will also be fireworks around Marina Bay on 7 and 8 August 2015, in addition to the actual day on 9 August 2015! And if you are planning to head down to catch the Fireworks in all its full glory, here are the best Vantage spots around the Marina Bay area to view them. So as my monkies will tell you, it's going to be an awesome NDP! Don't have a ticket to NDP 2015? Fret not, as this year's Golden Jubilee celebrations will see multiple celebrations sites being set up around Marina Bay on 9 August 2015 so as to allow more Singaporeans to celebrate together. 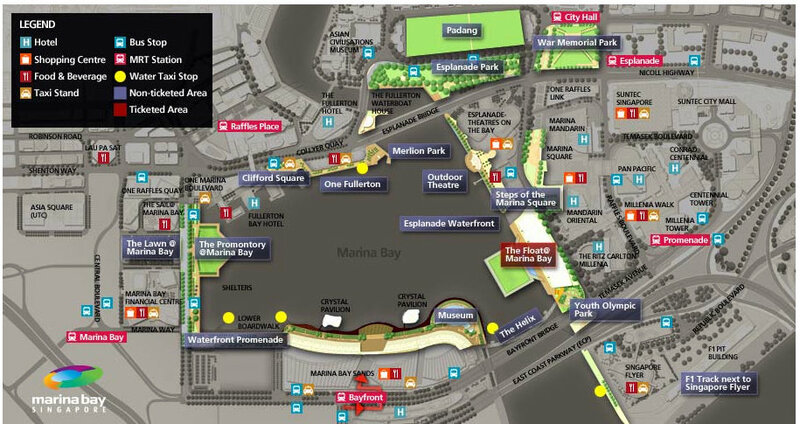 This includes eight prominent locations around the Bay, where large LED screens will broadcast the National Day Parade from the Padang “live” on 9 August. They include The Float @ Marina Bay, Marina Bay Sands (MBS) Event Plaza, MBS Event Sqaure, The Promontory @ Marina Bay, Merlion Park, Esplanade Theatres by the Bay, Singapore Flyer and Marina Barrage. On top of everything, indulge in a host of CELEBRATIONS BY THE BAY activities over the long Jubilee Weekend of 7 to 10 August 2015! Relive the worlds with Uncle Ringo! Synonymous with local carnivals, Uncle Ringo recreates the amusement parks of yesteryear at the Waterfront Promenade. Catch dazzling light shows and see the bay light up like never before with specially designed custom-made light installations. See the bay awashed with our national colours! Located at the Waterfront Promenade (next to MBS Convention Centre), the carnival is open to public to enjoy 12 unique home recipes as they enjoy the celebrations at the Bay. These recipes have been specially curated from the #SgEatWithUs carnivals and satellites events where home chefs have stepped out willingly to share their home-cooked food with the community. No entrance ticket is required and to enjoy the home-cooked recipes, a food card is required. In celebration of Singapore’s Jubilee Anniversary, one of Singapore’s most iconic waterfront landmarks, The Fullerton Hotel Singapore, has lined up a nine-day tribute to the nation’s 50th birthday with a spectacular projection mapping that will see the hotel’s magnificent façade brought to life through the use of latest 3D animation and projection techniques. The nightly, 8-minute spectacular will be the first and largest projection ever seen on a building in Singapore, promising to be a visual treat for its visitors. The project will also offer glimpses of key episodes in Singapore's history over the past 50 years while encompassing elements that pay homage to our shared heritage of cultural and racial diversity. A special SG50 exhibition by S’pore Discovery Centre, this exhibition is specially curated for Singaporeans by Singaporeans to celebrate 50 years of nationhood. The exhibition covers aspects of Singapore’s Past, Present and Future through photo essays as well as sounds and songs of the different decades. It includes personal stories, fun facts and interactive activities, and also explores the hidden landscapes of the future in the Future Simulation Theatre. Travel back into Singapore’s past and explore our rich heritage in a series of thematic exhibitions at Clifford Pier. Celebrate National Day with a variety of free performances, workshops, talks and an interactive artwork that explores the sights and sounds in our everyday lives. Join us at our Esplanade Concert Hall open house on 8 Aug for a unique chance to experience the hall’s acoustic features in action and enjoy a variety of music performances. For a detailed listing, visit HERE. Enjoy a day fun filled carnival activities at the barrage for Singaporeans of all ages! On 7 and 8 August, 8am-11am, enjoy a family picnic at the Marina Barrage organised by Families for Life (FFL) - a collaboration between Families for Life, RSAF, PUB and NParks. Families can enjoy their family time together with fun-filled activities and programmes such as the Black Knights aerial display, performances by the SAF Music & Dance Company, food trucks, childhood games, inflatable bouncy castles and a Families for Life mobile café. Registered families will receive a “Families for Life” picnic bag. On 9 Aug, in addition to carnival activities, there will be a live screening of NDP (4pm to 8.30pm) on the Green Roof where audiences can watch the celebrations against the spectacular city skyline. Be prepared to be enchanted by their thrilling aerobatics and formations as the Black Knights from the RSAF soar across the skies! With side-splitting stand-up comedy performances by Hossan Leong and Mark Lee, as well as an outdoor movie screening of Army Daze, you can bet this is one celebration you would not want to miss. Not only is Singapore Flyer one of the 6 official venues with LIVE streaming of NDP 2015, it is also one of the prime spots to catch the Republic of Singapore Air Force’s (RSAF) Black Knights flypast! For more details, visit HERE. Our active agers and their families may reminisce sweet memories of yesteryears with live band performances by one of Singapore's most versatile pop groups of the 60’s — The Silver Strings; and have a great time with the dynamic emcee duo of Irene Ang as housewife Rosie Phua and Moe Alkaff! Families with their young ones will join the largest Jubilee Babies Celebrations by the bay! The annual Baby's Day Out is back to celebrate babies' milestones and thank parents for their selfless dedication to families and contribution to nation building. Youths from the Labour Movement and their families will celebrate our nation’s birthday with live screenings of the National Day Parade, interjected with live performances and a symbolic candle-lighting moment. Be enthralled by performances from renowned local artists like Gareth Fernandez, Shirlyn and the UnXpected, The Lion City Boy, Inch Chua and 53A. Audiences would also have a breathtaking view of the aerial display, Presidential Gun Salute and fireworks display at the bay. Where exactly is the black knight performance. I only know is 12pm at marina Bay Area but exactly which spot can I catch it. Some day off marina South waters. Where ar? Basically, from Aug 7 to 9, at noon each day, the Black Knights will be performing 22 manoeuvres, including opening and finale formations, in a 25-minute aerial performance above the waters off the Marina South area. Marina Barrage will be a good palce to view the displays.